The ACU - Who and What are We? The ACU is the internationally recognised National Governing Body for motorcycle sport in the British Isles (less Northern Ireland). Formed in 1903, the ACU has a long tradition in the world of motorcycle sport being a founder member of the World Governing Body, the Federation Internationale Motocyclisme (FIM). The ACU has a major role in furthering the interests of motorcycle sport on a global basis. The ACU represents 23,000 licence holders, 3,000 volunteer Marshals and Officials, 550 members Clubs and issues up to 4,000 motorcycle sport permits each year. 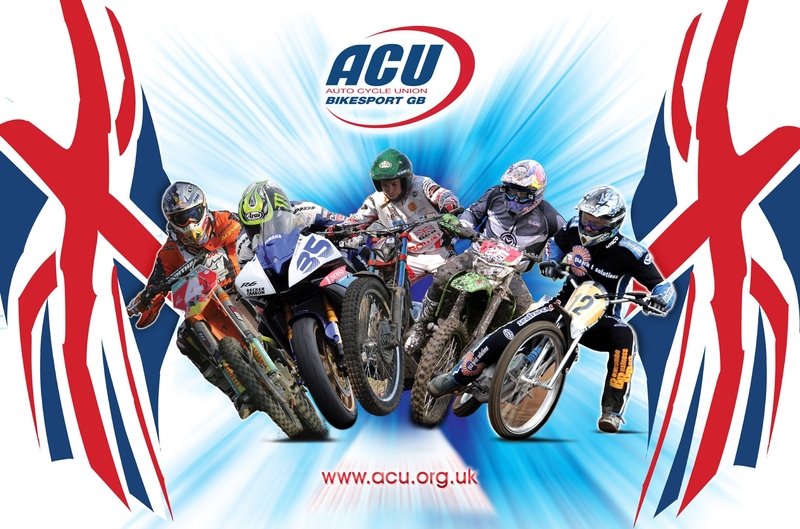 Domestically, the ACU provides for all forms of motorcycle sport ranging from Road Racing to all disciplines of Off Road activity and has successfully organised world class events such as Moto GP, World Superbikes, the Isle of Man TT Races, the Motocross of Nations and Trials Des Nations. The ACU aims to ensure that all people irrespective of their age, gender, disability, race, ethnic origin, creed, colour, social status or sexual orientation, have a genuine and equal opportunity to participate in motorcycle sport at levels in all roles. The ACU fully supports youth activity in all disciplines and through the Academy, some of our young riders go on to become British, European and World Champions in their chosen sport. If you already organise motorcycle sport events and would like to join the ACU, we would like to hear from you. The ACU provides excellent insurance cover, details of which are given in this information pack and can be found under the insurance tab located on the Home page of the ACU website (www.acu.org.uk). New Clubs are required to pay a one-off joining fee of £50.00 and details of how to join are given below. A Club Affiliation form should be completed and forwarded to your ACU Local Centre. You will find the contact details listed in the ACU Handbook which you can access by clicking on the following link; ACU Handbook. Your application should be accompanied by a cheque for the joining fee of £50.00 made payable to your Local Centre, together with a signed copy of the Standard Form of Agreement. You should also include a copy of your Club rules, a set of specimen rules are available to assist you. The Local Centre will consider your request and will probably invite you to the meeting at which your application for affiliation is to be discussed. Once approved by the Centre, your application will be forwarded to ACU Head Office and will then be put before the ACU National Council for approval. Confirmation of approval will be sent to your Club and to the Local Centre concerned. A Club Affiliation form should be completed and forwarded to the General Secretary at ACU Head Office, Wood Street, Rugby, Warks, CV21 2YX. • You must have at least 100 registered members resident in England and/or Wales. • You must operate on a non-regional basis. Non-Territorial clubs are normally the larger Road Racing clubs, which operate at several different circuits in England and Wales. A Non-Territorial Club is a Club, Association, Institution or other body or section of such a body connected with motorcycle sport having objectives, activities and membership which does not restrict it to Local Centre membership. The ACU Handbook gives details of what is required of a Non-Territorial Club (see section entitled Rules of the Union). If you feel that this is the suitable route for your club to take, the Club application form should be completed and returned to the General Secretary at the above address, together with a cheque for the joining fee of £50.00 made payable to “ACU Ltd” and a signed copy of the Standard Form of Agreement. You should also include a copy of your club rules with your application, a set of specimen rules are available to assist you for your information. Your application will be referred to the Non-Territorial Club Board for consideration and, if accepted, will then be put before the ACU National Council for adoption. To be considered for affiliation to the ACU, a Recognised Promoter should complete the Standard Form of Agreement and return it to the ACU General Secretary. Please enclose a cheque for £50 with your application being a non-refundable one-off initial Registration Fee. Thereinafter, you will be required to pay the annual affiliation fee of £50 and the permit fee for each event which will be negotiable, depending on what type of event you wish to run. 1. The name of your Company/Organisation and your Company Registration number and the date it was established. 2. A complete set of your most recent accounts. If no accounts are available, please supply your experience in motorcycle sport to date and give the names of two individuals who might be able to provide a character reference on your behalf. 3. Details of the type and frequency of the events you intend to organise. 4. Details of the Counties and venues in which you intend to hold organised events. In addition to ACU Head Office, for administrative purposes, the ACU operates through a structure of 20 Local Centres each responsible for the management of the sport in their geographical area. Should your Application for Affiliation to the ACU be accepted, you will be given details of each of the Local Centres covering the areas in which you propose to operate. Whilst your Affiliation will be direct with Head Office I am sure you will appreciate that consultation and co-operation with the Local Centres will be necessary in the interest of good relations and to avoid difficulties over the allocation of dates on which events are to be held. This liaison will be carried out in the first instance through the Main Sporting Committee Secretary based at ACU Head Office from whom you will obtain all official Permits, Insurance, Track Certificates and the like in connection with your events. ACU Head Office, as the Permit Issuing Authority will appoint a licensed Steward to be present at any organised meeting you hold. The functions of such a Steward are described in the National Sporting Code of the ACU which also sets out the basic framework and the rules under which every event is run. What do I need to think about when organizing an event? Have I got somewhere to run my event? Organising a motorcycle sport event is not as easy as it may seem. There is more to it than getting a bunch of keen enthusiasts together with some motorcycles and letting them loose around a field. As silly as it may sound, but the first thing to consider is some land. Have you got a piece of land or a venue fit for purpose and suitable to run the event you have in mind. This could be an established Practice Track or some land that is privately owned. If your proposed circuit is not an established permanent circuit and has to be built specifically for your event, then once completed, before any wheel can be turned either in practice or racing, a Temporary Course Certificate (TCC) is required for all ACU events and these TCC’s are only valid for the period of your event. A TCC shall only apply to an event where a Permit has been issued by the ACU and is organized by ACU affiliated clubs and promoters under the supervision of Officials authorized/licenced by the ACU. Have you got the structure in your Club in place to organize an event? Every ACU permitted event requires a licenced Clerk of the Course to run a meeting. The Clerk of the Course is responsible to the Organiser (ie. your Club) for the good management and conduct of a competition held in accordance with the ACU’s National Sporting Code, the Supplementary Regulations for the event and the Official programme for the event. Potential Clerks of the Course can obtain a regional licence by attending a seminar to learn more and become qualified as a Clerk of the Course. A licence is valid for a period of three years. Other licenced Officials for your meeting will include a Technical Official who is responsible for ensuring that every machine (solo or sidecar) that takes to the track is fit to do so. Marshals. No need to be licenced, but integral to any meeting. You need to ensure you have enough Marshals in place for your event. A Medical team needs to be appointed and the various medical requirements can be located for each sporting discipline in the relevant Standing Regulations contained in the ACU Handbook. For further help and guidance on how to organize a successful meeting, contact any local clubs around your area or your Local Centre. If you are unsure of whom to contact, all Club contacts for each Centre can be located in the ACU Handbook. What is a Permit? Well, quite simply so far as the Organiser of an event is concerned, a permit is an Insurance cover note. Once a Permit has been issued by ACU Head Office or a Local Centre, the Organiser has sufficient Insurance in place for the event to take place. The ACU is one of eleven authorised bodies in Great Britain to issue a Permit for Motorsport as defined by the Department of Transport under the Motor Vehicles (Off Road Events) Regulations 1995 and where an event is an 'Authorised Event', by application of and in receipt of a Permit, the event is exempt from Sections 1-3 of the Road Traffic Act 1988 (amended 1991) whilst the event is being run in a public place (other than a Public Highway). This exemption shall only apply to those competitors whilst participating within the rules of the event and to those Officials for the purpose of undertaking their duties at the event. Permit Application forms can be found on the ACU’s website-www.acu.org.uk. Look down the left hand side of this page and you will see the Resource Section. Click onto the tab Licence and Forms and scroll down until you see the heading 2011 Event Paperwork. You will then be able to click onto the relevant Permit Application Form for either a National event or a Centre level event. You will also find some event paperwork; eg. Competitors and Officials Signing On Forms and a Motorcycle Entry Form. email: dw@acu.org.uk for further details. Please contact Debbie Walmsley on 01788 566419 or email: dw@acu.org.uk for further details. The Permit fee is paid on application for a Permit which should be accompanied by two copies of the Event Supplementary Regulations and a copy of the Motorcycle Entry form for the event. Ideally, Permit applications and associated paperwork should be sent to the Permit Issuing Authority (ACU Head Office or Local Centre) six weeks before the event is due to take place. For events held under Centre permits, as the fees may vary, it is advisable to contact your Local Centre before applying for a Permit. A copy of the Supplementary Regulations and the Motorcycle Entry form for the event should be submitted with the Permit application together with the appropriate fee. The ACU Insurance provides cover for any ACU activity which - quite simply put – allows the Organiser who organises an event under an ACU permit to ‘sleep at night’ in full knowledge that his event has more than enough cover should any unfortunate incident take place. Available for a fee of £699 (for one day, £920 for a two day event), Basic cover provides £10m Public Liability protection. The figure of £699 is based on an event entry of 90 competitors. Organisers are required to complete a post event return showing the numbers of competitors. Events with less than 90 riders will be rebated, again on a sliding scale to a lower level of 60 riders. Premier Permits will continue to operate using the traditional insurance matrix. Fees based on a per capita rate per head which are discipline specific, Premier cover provides £30m Public liability protection. Personal Accident benefits for Officials/Marshals are also outlined in great detail. It should be noted however, that Personal Accident benefits for Competitors are only available under Premier Cover which means for those events held under Basic, it is the individual responsibility of the competitor to arrange his own Personal Accident cover. The assessment of risks associated with the sporting element of our various disciplines has been undertaken by the relevant Sport Committees at ACU Head Office and are reviewed annually. Licenced Officials of Local Clubs/Organisers of Off Road Speed events will be sent a copy of the booklet 'ACU Requirements for Safety Precautions at All Speed Events held under an ACU Permit' updated and produced annually - normally in January/February of each year prior to the start of the following season. For those organisers of Road Race meetings held on permanent circuits, the Risk Assessment for the circuit will be reviewed periodically during the Circuit's Track Inspection and therefore the Risk Assessment will be available for viewing with the Circuit Track Inspection report. The PR Officer is available to assist and advise on publicity matters in general and will help promote your event by publicising details of your meeting on the ACU website. It should be noted that on the Home Page of the ACU website in the left hand side, there is a box entitled 'Latest Events', and by clicking 'View All' you are able to see what ACU events are taking place around the country. The Events list is automatically populated by the ACU Permit system, which means that whenever an ACU Permit is published for an event at either ACU Head Office or within a Centre, the details of that event automatically appears on the ACU website in the Events section.